For me, the biggest source of culture shock in Indonesia is not the spicy food and rice with every meal. It is not suara adzan, the five-times daily call to prayer which rouses the faithful from their beds at the (un)godly hour of 4 a.m. It is not the staring and pointing I receive in public as a blonde-haired, blue-eyed woman. No, the biggest source of culture shock is the simple act of getting from Point A to Point B: driving in Indonesia. Motorcycles are fun, convenient, and incredibly dangerous. I guarantee that anyone you meet in Indonesia knows someone–their cousin, classmate, wife–who has died in a motorcycle accident. Do your best to avoid adding yourself to that ever-growing list. Educate yourself about motorcycle safety. Wear a helmet, shoes with traction, and clothes that will shield you from both the equatorial sun and possible road rash. Drive within your limits. Take the oft-heard Indonesian parting words “Hati-hati di jalan! Be careful on the way!” to heart. You never know what sort of surprises you’ll see while sitting in traffic in Indonesia. The streets of Indonesia will challenge your definition of “possible.” A family of five riding on one scooter? Possible. Two SUVs coolly breezing past each other on a one-lane road? Possible. A motorcycle passing a car passing an SUV in a blind curve? Possible. A jenky public bus backing down a mountain road for over a kilometer when the path ahead is deemed impassable even by Indonesian standards? Possible. For drivers and passengers alike, venturing onto the streets of Indonesia can be a white-knuckle ride. Hold on tight and prepare to be amazed. 3. (Usually) drive on the left. Indonesia subscribes to the left-side-of-the-road way of life… most of the time. Legally motorists are obligated to drive on the left but cars and motorcycles alike will utilize the lanes of oncoming traffic when that is the most convenient option. Many times I have heard the voices of angels while I stared down an oncoming truck’s flashing headlights when, at the last possible second, a casual flick of my driver’s wrist swerved us back into the safety of our own lane. 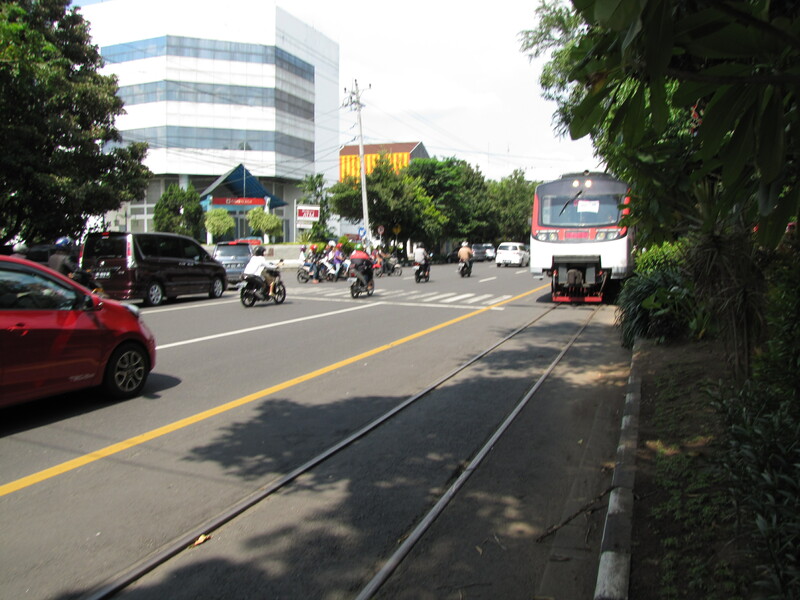 As a driver in Indonesia you are strongly recommended to avoid tempting fate and drive on the left. 4. The road is anywhere that wheels have traction. Motorcycles have a special privilege in that they are small and not bound by asphalt. It is the norm for motorcycles to whiz past lines of cars via the space between lanes or on the shoulder of the road. 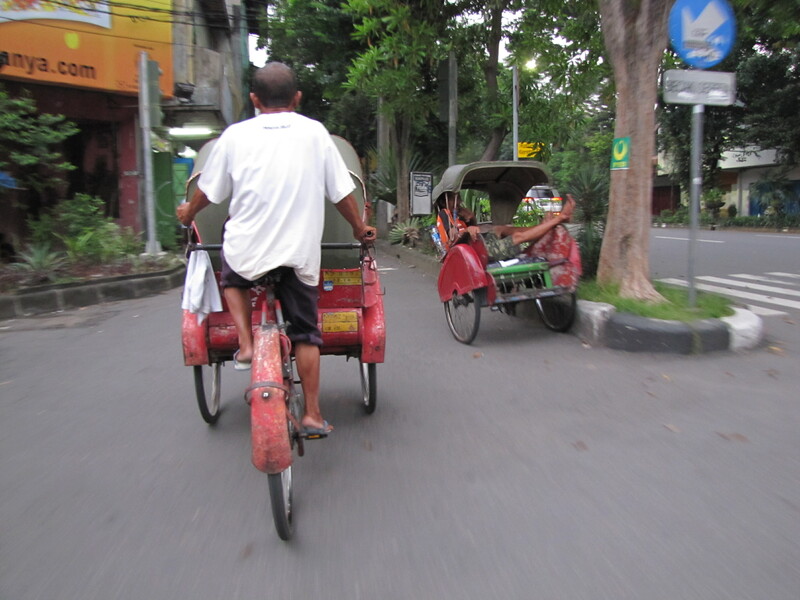 Anywhere that wheels have traction counts as the “road” in Indonesia and will be utilized as such. This includes sidewalks and narrow alleys choked by poor urban planning. 5. The speed limit is as fast as you can go. The first time I felt my weight double due to gravitational force outside of an amusement park was terrifying. I had been in Indonesia for only a month when I found myself in the front seat of my friend’s sedan as he careened through the back roads of Bangka, accelerating like he was aiming for the moon instead of the neighboring town of Sungailiat. He laughed as I broke with convention and actually buckled my seat belt, which most Indonesians wear as a mere accessory draped across their front (if they bother with it at all). 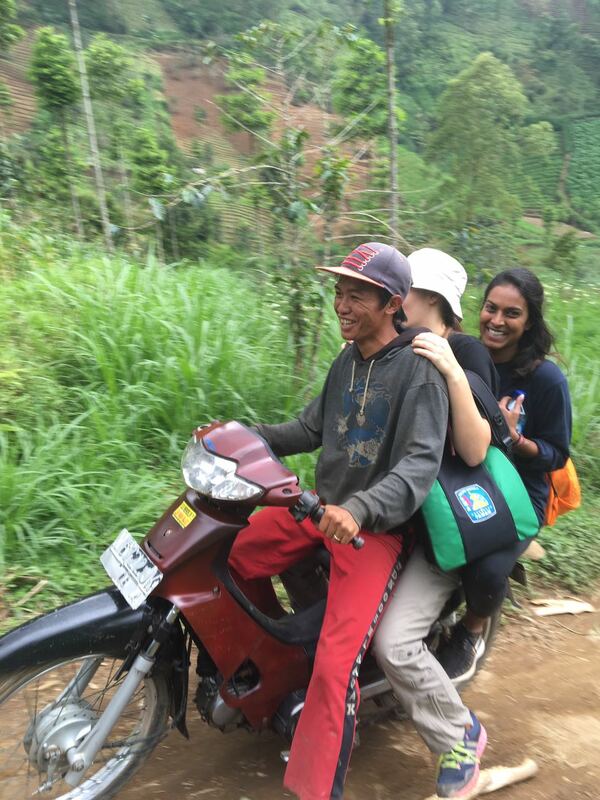 Thankfully we made it to our destination safely, but that was just a taste of normal Indonesian driving behavior. If the road is clear and open, it is expected that you will drive as fast as physically possible. 6. Right of way is given to the loudest driver. Beep beep! Honk! Beeeeeep! ANJING! ** The streets of Indonesia are a noisy place. The beeping and honking is immediately noticeable, especially for someone who comes from a culture where honking your horn is a highly aggressive act. But in Indonesia, horns are a communication tool and rarely signal aggression to other drivers. A tap of the horn can mean anything from “I’m passing you” to “don’t back up yet” to “I’m gonna run this red light, please don’t hit me” to “whassup bro?” Liberal use of your horn is strongly recommended because the more aware other drivers are of you, the better. The contents of these glass bottles can be of questionable quality: buyer beware. 7. Never pump your own gas. 8. All roads lead to home. Grid street plans never caught on in Indonesia, which makes navigating its kota-s [cities/towns] and kampung-s [villages] an acquired talent. As you get comfortable taking to the streets on your own wheels, don’t panic if you accidentally pass the entrance to your neighborhood. U-turns are always possible, even when the local signage suggests otherwise. Do NOT make a sudden, desperate turn as this unpredictable behavior is exactly the kind of thing that causes accidents. Play it cool and take the opportunity to learn a new way to pulang [go home]. 9. Expect to pay for parking. As surely as there are hungry parking meters lining the roads of my hometown of Chicago, there are attentive parkirs waiting along most modestly busy Indonesian roads. A parkir is a man who spends his days smoking cigarettes and lounging on the roadside, collecting money from any vehicle that stops in his narrow kingdom. Parkirs usually charge 1,000-2,000 IDR for motorcycles, sometimes more for cars. Parkirs can be helpful–even necessary–to help you rejoin traffic during rush hour. They can also go above and beyond, like the time a parkir took the bags I left hanging from my motorcycle (which included all the English magazines I brought for my students from America) into a nearby store when it began to rain while I was doing my shopping elsewhere. While some parkirs will conjure images of vultures in your mind, most are genuinely helpful. 10. Everybody and their uncle is a traffic conductor. Like the parkirs, unofficial traffic conductors keep cars and motorcycles moving in the thousands of congested intersections that have no other traffic signals. They may be clearly identifiable by their orange vests, flashing batons, and whistles. Equally possible is they may be half-crazed men screaming and waving a tree branch at an invisible orchestra. Either way, these conductors are necessary to keep traffic moving. As such, they are rewarded by thankful motorists who hand off coins and small bills as they pass. Whether you are just visiting for a week or you’re in it for the long haul, your time in Indonesia will be greatly enhanced if you learn some bahasa Indonesia. Below are some phrases that can help you navigate the roads as both a driver and passenger. Mau ke mana? = Where are you going? Saya mau ke ____. = I am going to ____. Jalan ke ____ lewat mana? = Which way to ____? Di mana ____? = Where is ____? Saya tersesat. = I’m lost. Belok kanan/kiri. = Turn right/left. Putar balik. = Make a u-turn. Salah jalan. = Wrong way. Satu arah. = One way. Lampu lalu lintas. = Traffic light. (Pompa) bensin. 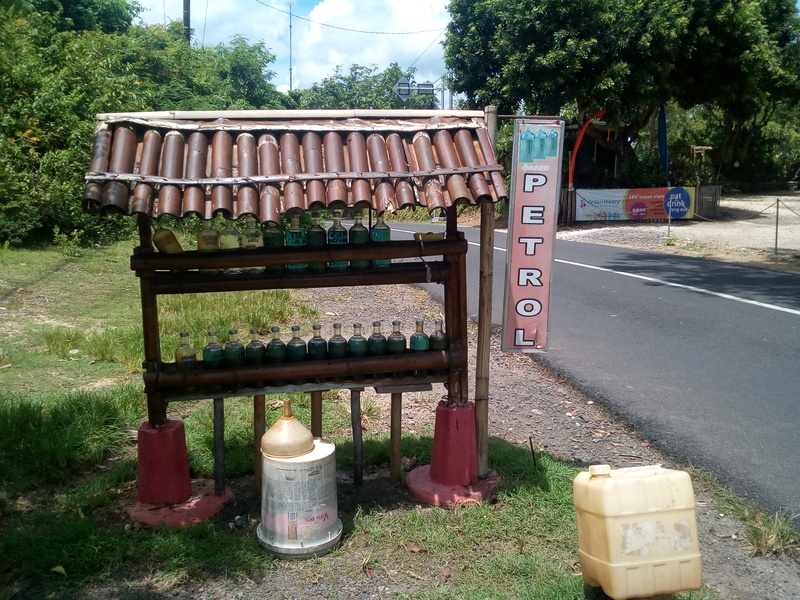 = Gas (station). Ban (kempes). = (Flat) tire. Applications like GoJek, Uber, and Grab offer fast and reliable transportation in Indonesia’s larger cities. 12. Always have a phone. The average Indonesian never leaves home without his or her phone and you shouldn’t either. A cell phone is a small thing that can make a big difference when you get a flat tire in the middle of nowhere and need to call for help or when you lose your way and want to ask Google Maps for directions. And if you live in a larger city like Jakarta, Surabaya, or Makassar, a reliable driver is at the tips of your fingers through ride-sharing apps like Gojek, Grab, and Uber. 13. Don’t rely on street signs. In the United States, nearly every street is identifiable by a neat sign bearing the name of the street that is parallel to the sign. In Indonesia, street signs are few and far between, not least of all because the same street changes name from town to town or even neighborhood to neighborhood. And if you are lucky enough to have visible street signs in your area, don’t make the mistake of thinking that the system of hanging street signs is the same as the U.S.A. and many other countries. Instead, in Indonesia street signs bear the name of the street that is perpendicular to the sign. Thus, if you are standing in an intersection and looking at a street sign, the name on the sign is the name of the street you see beyond the sign, not the street running from your right to left. Confused? Don’t worry. Directions in Indonesia are better by giving landmarks anyway. 14. Streets are for parties. Nothing completes an outfit like a pair of rubber pants. 15. Assume it is going to rain. Weather can change instantly anywhere along the Equator, especially during the mercurial rainy season which lasts roughly from November to March. It is possible for a sunny afternoon to turn into a roaring tropical storm in a matter of minutes, or even for rain to fall on one side of the road but not the other. While this is no problem for cars, it can really put a damper on a motorcycle rider’s day. 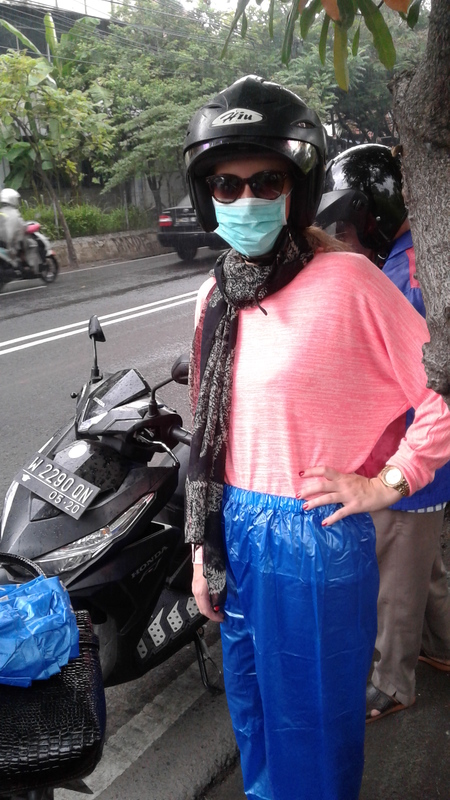 If your ride has two wheels, invest in a rain jacket that you can stash under your seat in case of hujan [rain]. 16. Have a plan if you are stopped by police. It is possible that you, as a motorist in Indonesia, may someday be stopped by Indonesian police for any reason. It is wise to think ahead of time about what you would do in such a situation. Think of what you can say (and in what language), who you can call, and whether or not you want to try your hand at the bribery game. Not all Indonesian police are corrupt, but it is safe to say that a blue (50,000 IDR) or red (100,000 IDR) bill or combination thereof can clear up almost any “misunderstanding” between you and local law enforcement. It is your responsibility to determine what requirements there are for you to legally operate a vehicle in Indonesia. Many times, police are simply checking for motorcycle registration and driver’s licenses. 17. Love me, love my ride. While the U.S.A. is home to the original car culture, Indonesian youth has taken love for their automobiles to the next level. Every corner of the country is home to various car and motorcycle clubs formed around a common love of specific brands, models, and even colors. Car and motorcycle communities are most commonly found hanging out on the side of the road on Friday or Saturday nights or driving in packs while flying a banner on Sunday afternoons. 18. Know who else is on the road. Indonesia is rich in diversity in every sense of the word. 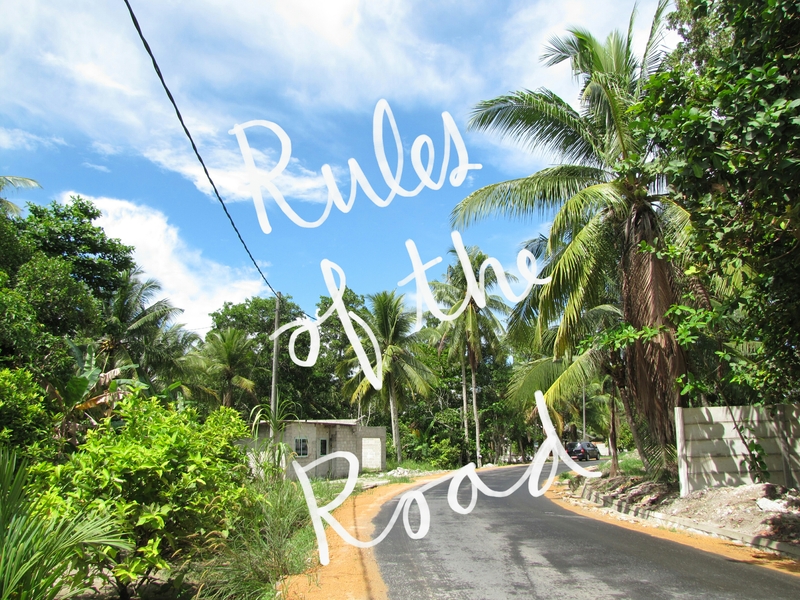 If it rolls, jerks, rumbles, or roars, chances are high that it is on the roads of Indonesia. Certain modes of transportation are unique to some areas, such as the TransJakarta bus system and bajais of the nation’s largest city. Other forms of transportation are known by different names and have slightly different incarnations depending on the area. Click the images below to learn more! 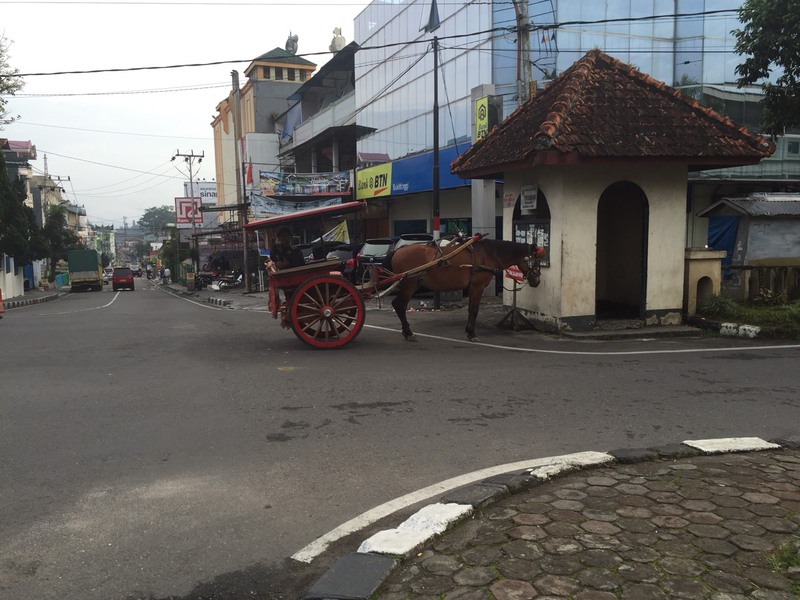 Horse carts, called delman, cikar, dokar, or andong depending on the area, are still a common sight in both city roads and country lanes. 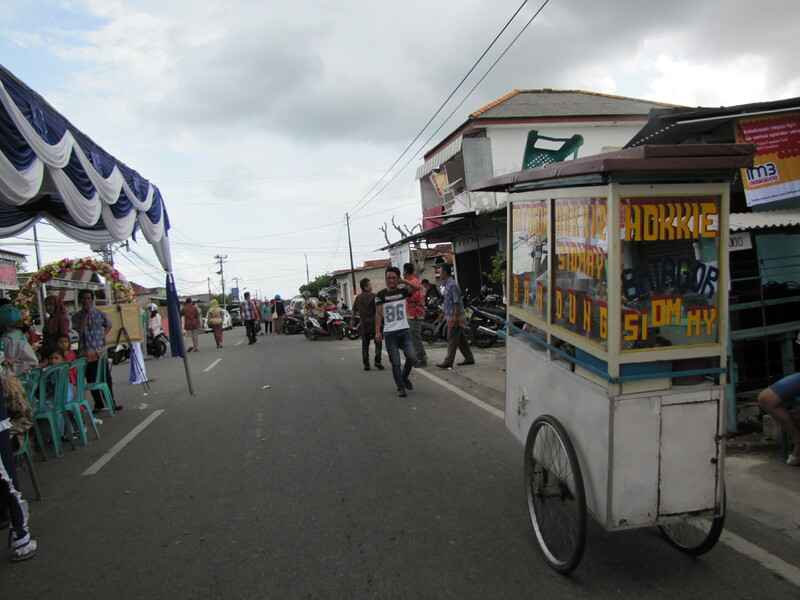 Everything from wedding tents (left) to kaki lima (mobile food carts, right) can block your path in the roads of Indonesia. Drive with caution. Becaks are three-wheeled, man-powered buggies used for getting across short distances. The driver pedals a bike behind and the passenger sits in a coered buggy in front. 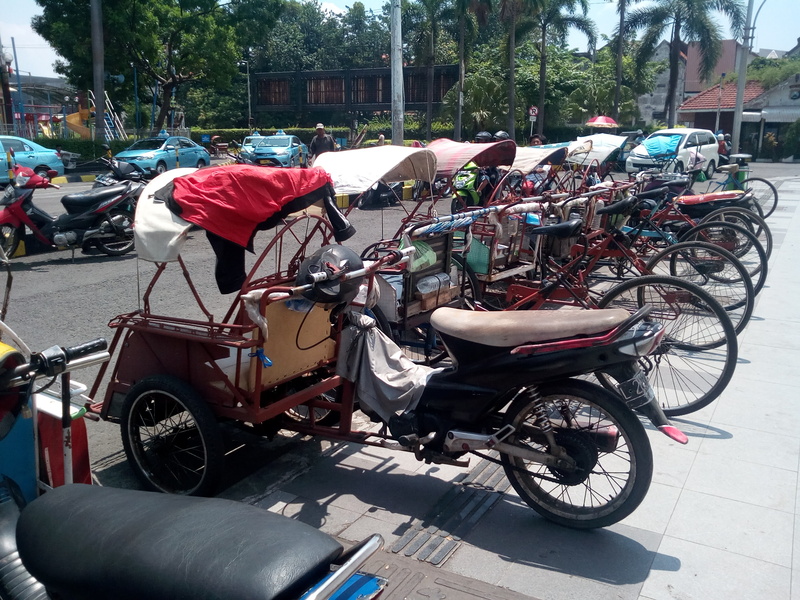 A bentor is a play on words combining “becak” and “motor.” A bentor driver rides on a motorcycle and the passenger(s) sit in a covered buggy in front. Some parts of Indonesia have a sophisticated train system that actually does run on time. A great option for traveling, especially in Java. 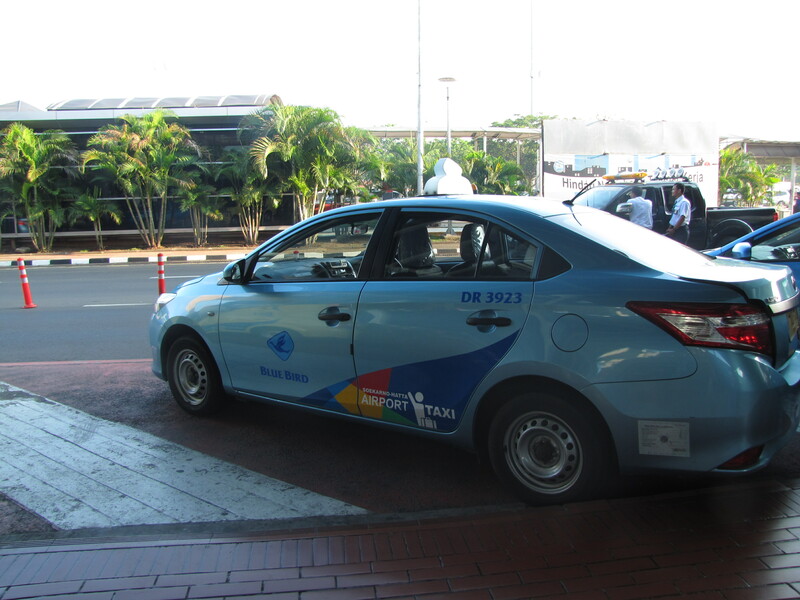 Blue Bird is the most reliable taxi company across the archipelago. Be cautious when using other taxi companies. If there is no meter, be sure to set a price before getting in the cab. 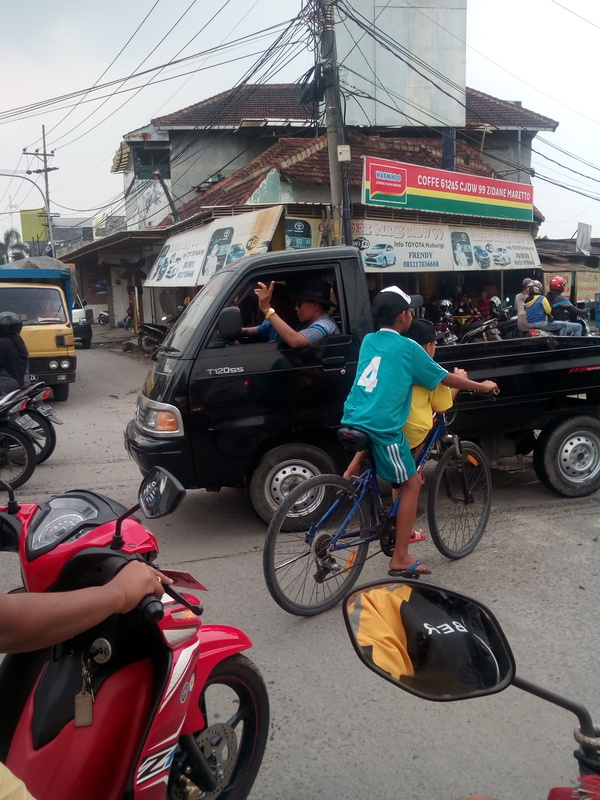 Bicycles across Indonesia can carry multiple children and other unimaginable loads. 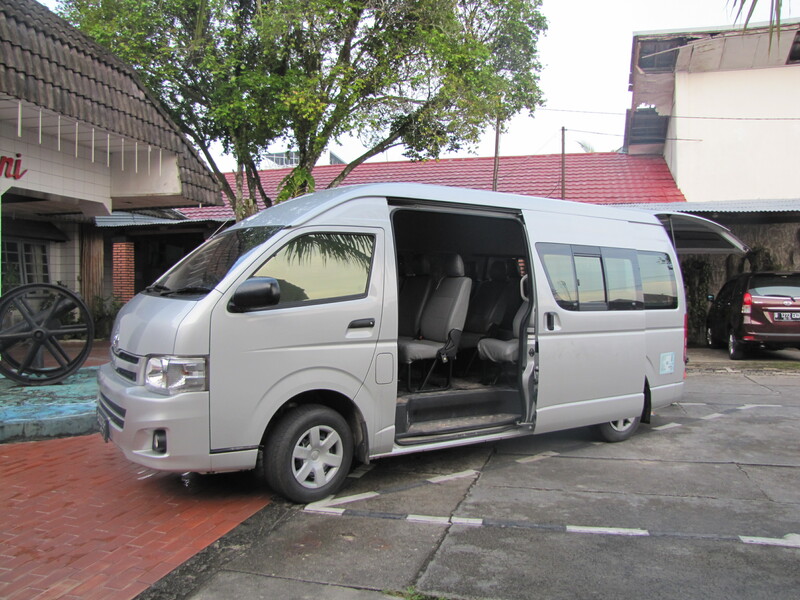 Large, 18-passenger vans are the mode of transportation of choice for most groups of Indonesians. “The more the merrier” is a very true concept in Indonesia. An ojek is a motorcycle taxi. Anyone can become an ojek driver, such as this farmer in East Java who kindly offered his services to tourists who wanted to see a waterfall that was off the beated path. This type of shared minivan is known by many names: bemo, angkot, mikrolet, lyn, oplet, and others. Bemos are shared vans that typically run on a set route, but drivers can easily be hired to go to a specific destination for the right price. There is a set price for riding the bemo regardless of your destination which can range from 2,000 to 5,000 IDR. 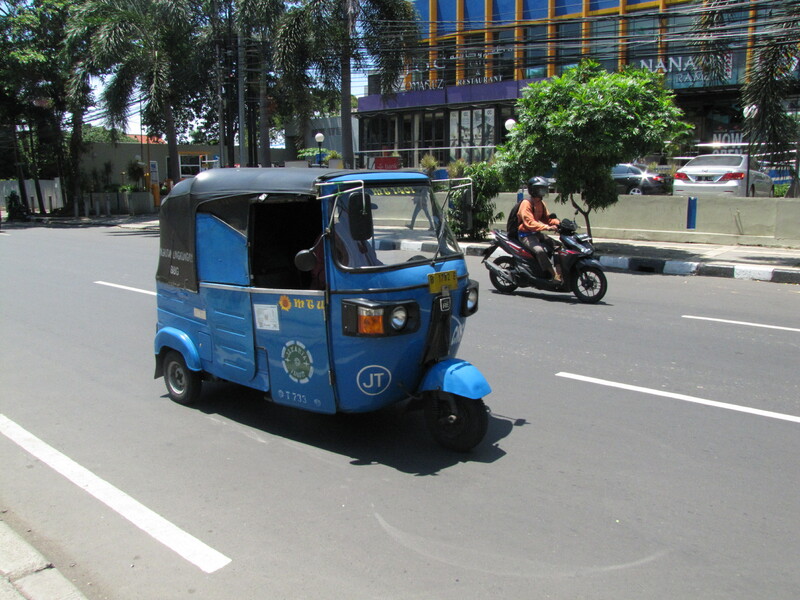 A bajai is a three-wheeled, self-enclosed vehicle similar to tuk-tuks in Thailand. 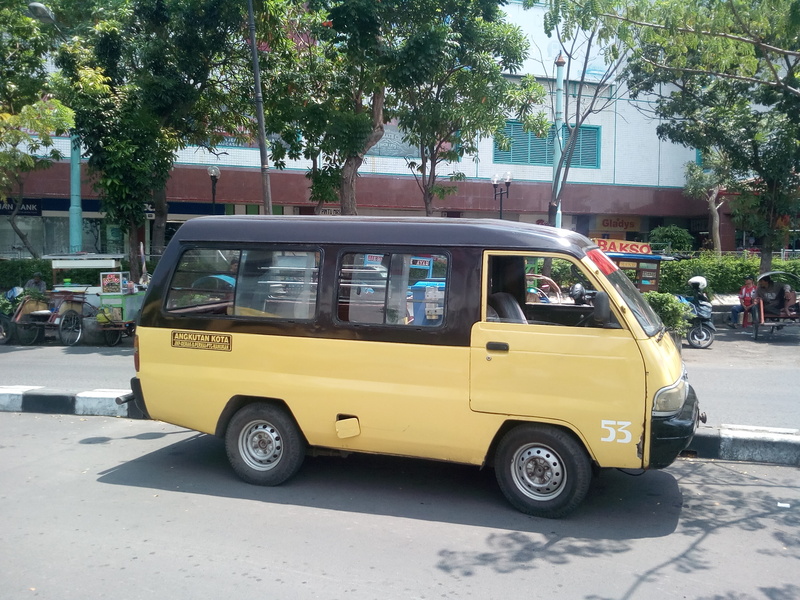 Bajais are most commonly found in Jakarta. The best metaphor I can think of to describe Indonesian traffic is that of fish in a rapidly flowing river. The fish are bound by the river’s current and every fish differs in size and speed. As a driver you become one of the fish in a larger ecosystem, and as such it is crucial that you go with the flow. Follow the “rules” above and, most of all, don’t be unpredictable. If other drivers can predict your next move, collisions are far less likely to happen. 20. Just get out and do it! Whether you are new to driving or you’ve been doing it for years, taking to the road on your own set of wheels can be intimidating anywhere, least of all in Indonesia. Always be careful, but don’t let fear paralyze you! Go step by step. Start in your neighborhood and venture out on Sunday afternoons, when the roads are quietest. Go only as fast as you feel comfortable and build up your confidence, kilometer by kilometer. In no time you’ll be cruising the streets of Indonesia on your own, wondering what worried you so much in the first place. * Throughout this article when I mention “motorcycles” I am referring to any motorized, two-wheeled transportation. This includes anything from huge, chopper-style bikes (few but proud) to putt-putt automatic scooters (the transportation choice of tens of millions of Indonesians) and everything in between. ** Anjing technically means “dog” but it is also used as a curse in situations such as when someone cuts you off in traffic. *** Nearly every city large enough to have an alun-alun [park in the center of town] is bound to have Car Free Day from dawn until mid-morning on Sundays. This is a time when people are free to ride bikes, walk, zumba, and otherwise enjoy the wide-open space for a few hours without the disturbance of cars and motorcycles. 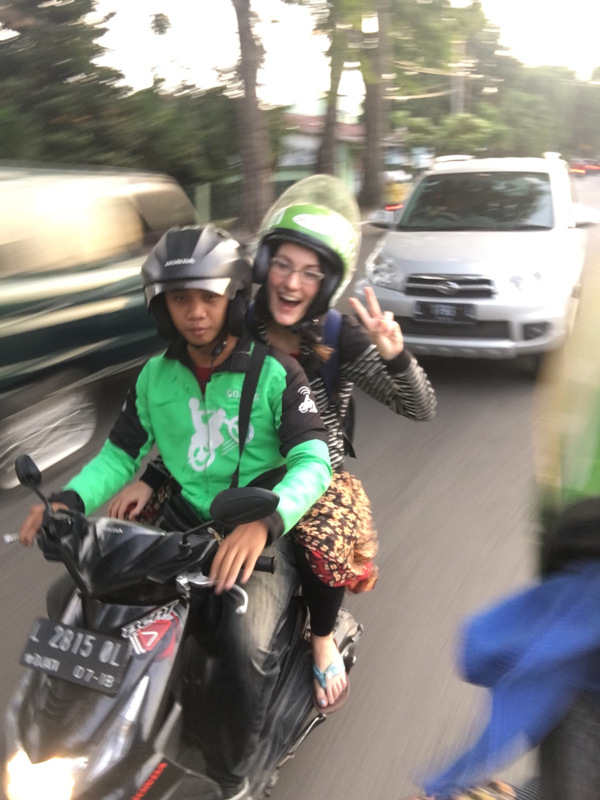 Kelly Fitzgerald is a second-year Fulbright English Teaching Assistant (ETA) living in Sidoarjo, East Java. She spent her first year cruising around on a scooter named Sally in Pangkal Pinang, the capital of the beautiful but lesser-known province of Bangka-Belitung. When she is not busy teaching, she enjoys learning Indonesian pop songs, drinking excessive amounts of coffee, and exploring Sidoarjo and Surabaya from the back of a Gojek. You can read more about her travels at https://whereintheworldiskelly.com/. She would like to note that the views expressed in this guide are her own and that neither AMINEF nor the Indonesian Department of Transportation nor any other entity encourages foreigners to drive in Indonesia.